I really wanted to post about this earlier, but somehow the entire week got away from me. 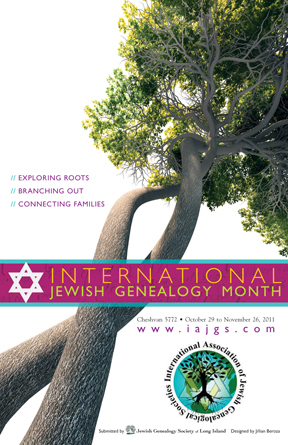 The inaugural Jewish Family History Open House on November 13 was great! I rushed back to California from Maryland, where I had been for my brother's wedding, to find that everything was set up and waiting for people to arrive. (All those e-mails back and forth while I was gone were effective!) Our first couple of researchers showed up early, and we then had a steady stream throughout the afternoon. Altogether about 50 people attended, and we had about 20 volunteers, almost enough to keep up with the flow, with only a few slight delays in providing assistance. The volunteers who so kindly gave up their Sunday afternoon were from the San Francisco Bay Area Jewish Genealogical Society, California Genealogical Society, and Oakland Regional Family History Center. The attendees were almost evenly split between beginners and intermediate researchers. Beginners had a short introductory class on family history and online research, and then everyone was assigned an experienced researcher to be a guide. People came with questions about research all over the U.S. and in many countries. We had several volunteers with special expertise in areas who were able to help with area-specific questions. Almost every attendee found some kind of information during the day. One man discovered he was indeed born in a concentration camp. A woman was dismayed to learn that her father and his brother, both survivors, had each not learned that the other had survived and ended up living not far from one another but never found each other again, but she is going to contact her cousins and reconnect the families. Almost everyone who came to the open house also attended Ron Arons' lecture, "Putting the Flesh on the Bones: Researching Why Our Ancestors Did What They Did", which he gave twice during the event. It is important to learn more about our ancestors as people, and not have them be merely names and dates on a page or in a database. Ron's talk is a great example of the kind of in-depth research someone can do on a person. I think we've started what could become a wonderful annual event here in the San Francisco area. If we hold it again next year, I'm hoping to have representatives from local archives come also, to talk about records that area available right here that people can use in their research. But right now I'm just looking forward to seeing the people who came to the open house continue with their research and learn more about their family histories.